Christine Pardee is not one to back away from a challenge, as indicated by her year-long commitment to go 100% car-free and do all of her commuting by bike. But it wasn’t just the physical challenge that inspired her to go car-free—it was also a long-lost connection to her own happiness that compelled her to pick up her bike again. As a child, Christine always found joy in sports. One could find her tumbling across the gymnastics mat, hitting balls on the tennis court or biking around the mountain trails of her childhood summers spent in rural Colorado. Her love of sports followed her through her teen years, where she was a competitive gymnast and even trained for the Junior Olympics. But as time passed and the responsibilities of adulthood took over, her commitment to cycling—and to her own best self—began to erode as her bike spent more time in the garage than it did out on the trails. Her wake-up call began in 2013 when her father passed and she got a divorce. Christine had coped with the stresses of her ending marriage and dying father by overworking and overindulging —specifically mochas. It was then that Christine, who was 50 pounds over her ideal weight at the time, realized that she had disconnected from her joy. Thus began her journey toward reclaiming her happiness. She finished managing her father’s estate, wrapped up her divorce and took a personal risk by moving from the hustle and bustle of Washington, D.C.—where her professional network resided—to the peaceful Rocky Mountains of her childhood summers. Christine’s relocation to Fort Collins, Colorado in 2015 sparked her commitment to, as she calls it, “becoming her best self”—which included returning to a healthy vegetarian lifestyle as well reuniting with one of the great loves of her youth, cycling. Fort Collins is a cyclist’s dream. The town has bike-friendly infrastructure, has relatively mild weather year-round and is home to one of the biggest cycling festivals in the country—Tour de Fat—sponsored by New Belgium Brewing Company, which was founded in Fort Collins. When a friend of Christine’s heard that she was relocating to Fort Collins, he casually mentioned that given the city’s bike culture she could probably switch from using a car to 100% bicycle commuting. At first she tossed off his suggestion—but the idea stuck with her. As luck would have it, she quickly learned that Tour de Fat had a program called “Car For Bike Trader”—where one person donates her car to charity, ceremoniously tosses her car keys away in front of a crowd of 5,000 people and pledges to go car-free for at least one year. When Christine heard about “Car for Bike Trader,” she immediately stepped up to the challenge, applied for the program and eventually became the 101st person to publicly pledge to go car-free. Christine decided to document the joys and trials of being a 100% bike commuter in her blog, where she shares what it’s like biking over 150 miles a week, slogging through the snow, rain and all other kinds of weather, meeting various characters along the way and offering her pro tips on the road. This past September 2017 marked the one-year anniversary of her journey as a “Car for Bike Trader” and she still continues to live car-free. As for her health, she is back down to a trim 134 pounds, her resting heart rate is 60 beats per minute, she has more energy than ever before and she has vastly improved her ability to manage stress. Beyond the health benefits, Christine has reclaimed her connection to her childhood love of fitness that brought her so much happiness many years ago. In fact, she loves cycling so much she’s now giving back to the cycling community by organizing company commuter clubs so that more employees are offered the support they need to bike to work. 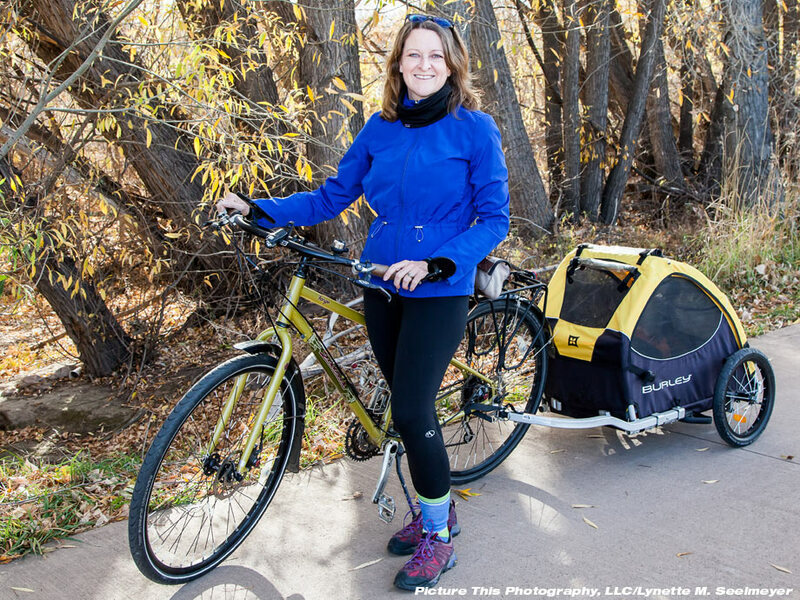 Christine’s bike rides and slower living pace in Colorado have offered her ample time for self-reflection over the past few years. One memory that stuck out for her was managing her father’s estate—an onerous task that was also a financial burden for her given that he didn’t have life insurance. Though Christine has no children of her own, she decided she didn’t want anyone to be burdened managing her estate without a support net. That’s when she decided to re-invest in a life insurance policy. Through a serendipitously-timed Facebook ad, Christine discovered Health IQ, a life insurance company committed to celebrating the health conscious. Health IQ has gathered science and data to convince life insurance companies that health conscious people, including cyclists, deserve lower rates due to lower mortality risk. Research shows cyclists live longer than non-cyclists, thanks to health benefits such as reduced cancer risk and lower incidence of cardiovascular disease. Health IQ interviewed Christine about her experience buying life insurance with Health IQ. Health IQ: What was your previous experience buying life insurance? Christine Pardee: I had life insurance years prior. But because I didn’t have kids, I thought, “What do I need life insurance for?” So I let my policy go. However after my father died—and he had no life insurance in place—I realized, “You really need some kind of reserve for the person who is going to have to deal with your death.” Life insurance, for me, is a personal responsibility. Health IQ: What made you go with Health IQ? CP: I remember this Facebook ad for Health IQ coming up with a very intriguing statement about how cyclists should benefit from their good health. And I thought, “Why isn’t there a mechanism in place that rewards people for being responsible with their health and for trying to work towards 0% environmental waste?” Well there is! I just didn’t know about it. The policy as it’s written meets my needs, the rates are extremely affordable and it works for me. Health IQ: What was the application process like? CP: It was really easy. And actually it was educational and fun. There was part of the application where you take a series of quizzes. The quizzes were interesting and the questions were not at all what I would have expected. They were higher level questions that, to me, was more indicative of testing whether I walked my talk. Some of them were things the general public—unless they had really taken charge of their health—wouldn’t know about. The other thing that I liked was the community aspect of being connected to other people who share your values of trying to strive towards maximum health. It was positive, fun and educational. Health IQ: Would you recommend Health IQ to your fellow cyclists? CP: Absolutely! I’d love to sell Health IQ! No question. Thank you Christine for being an inspiration for us all and for teaching us how reclaiming one’s health can help us become our best selves and provide access to greater happiness.